As we’ve seen in the past, XL3Link is a flexible formula that is really worth knowing about to help easily build interlinked reports. To some extent it’s like a Swiss army knife – multi-purpose! From highlighting a series on a chart to hosting a tooltip, XL3Link is a flexible formula that can help make your reporting more interactive at multiple levels. In this post we’ll be discussing a few more novel ways to use XL3Link. 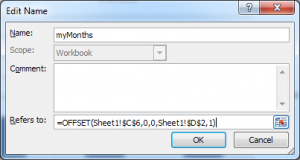 Have you ever tried copying parts of one workbook to another and been restricted by column widths? Or maybe you’re almost done with a report layout only to find that the last table you need to add has 4 columns, where there is only room for 3? Today we’re going to show you how to use Excel’s Camera tool to get around any Excel column width limitations to achieve your dashboard goals! 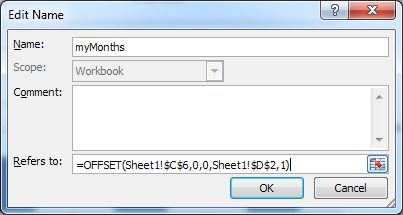 Here we have an Excel heat Map on a separate sheet in our workbook. It has been inserted into the dashboard below where the first thing to notice is the workbook’s variable column widths, in particular columns J and K. If we had just inserted our heat map as it was, the column widths in our dashboard would determine the width size of the heatmap. 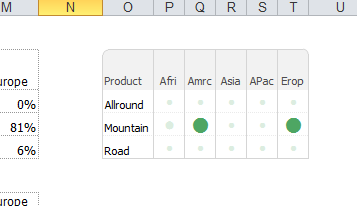 Instead we used Excel’s camera tool to insert our heatmap sized at exactly what we wanted, regardless of the destination sheet’s column widths. 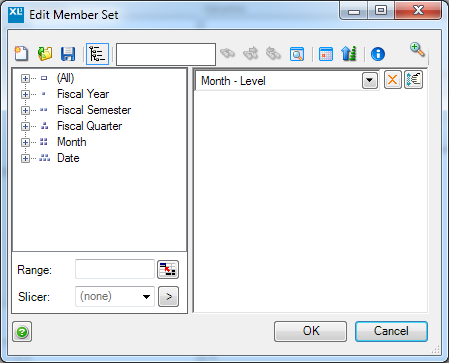 The Excel Camera Tool is also a great way creating dynamic screenshots of particular groups of data. The Camera Tool takes a picture of a selected area, and you can then paste that picture wherever you want it. It updates automatically, and because it is a picture rather than a set of links to the original cells, any formatting or data change in the source is automatically reflected in the picture. The dashboard heat map has updated automatically to reflect this value change. Find the Camera Tool from the alphabetical list of commands and add it to the Quick Access Toolbar. 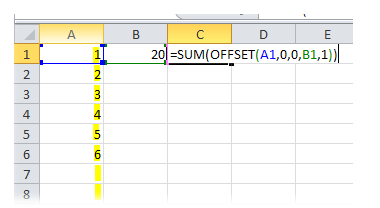 How do I drive the min and max values of an axis from an Excel Range? 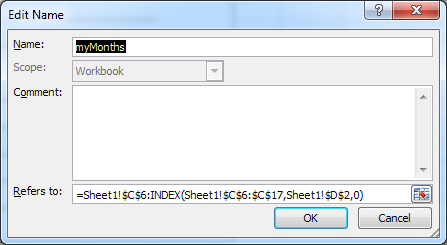 This is one of the most commonly asked questions about Excel and with each new release it always amazes me that this feature hasn’t been added to the base product. 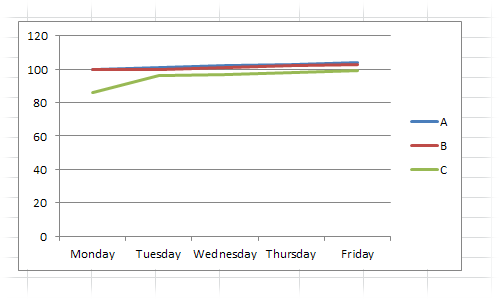 It’s a very common scenario to come across, you are building a line chart and it’s all looking ok until Excel suddenly decides to set the min value to 0, all of the detail is lost and you have gone from a nice detailed set of lines to a mishmash of colours a few pixels high. 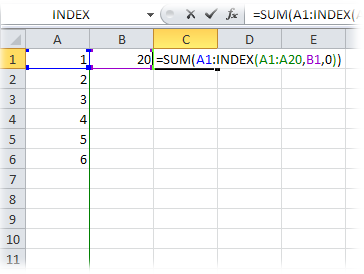 There are some pretty sophisticated techniques Excel is using when working out what min & max to use, but sometimes we just want to set them to a particular value (normally anything other than 0!). 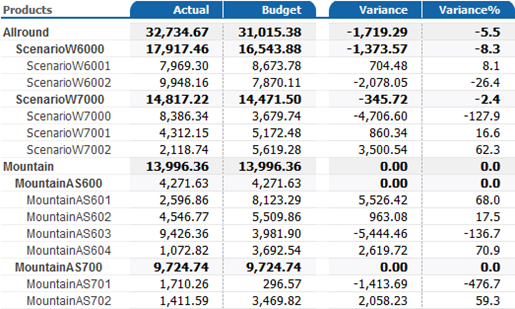 Here’s a pretty simple set of numbers and the resulting chart we get from Excel (just with all the defaults). Excel has applied its rules and decided that 0 is a good place to start the chart from, but in this case I lose a lot of the detail and end up with all the lines grouped together. The base numbers had been entered manually, so being able to type a fixed value into the minimum axis is fine, but what if the numbers were coming from a cube or Sql database? 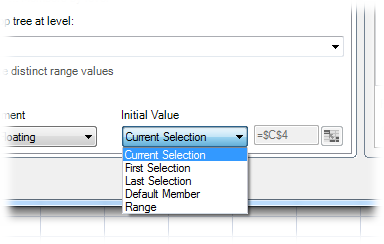 Wouldn’t it be really helpful to be able to drive the minimum value from a range; I can change just about every other thing about the chart but after so many years and so many different version I still can’t do this. Now finally we can build reports (and publish them to the Web), confident that regardless of the data or criteria selected we aren’t going to end up with a line chart starting at 0 and bunching all the lines together. If there are any aspects of Excel that you think would be useful to drive from a range, please let us know! This Heatmap Table shows you the revenues and the discounts of a company over the course of one year per product group. The size of a bubble shows the revenue made in a particular month and the bubble color shows the discount rate given. The discount rate has been encoded as a range of green colors, ranging from a light green, for low discounts to a dark green for high discounts. 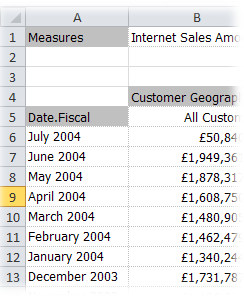 The years and product totals are shown at the right and bottom as an integrated part of the table. Tufte often talks about the integration of number, images, and word, and I think he’s quite right. 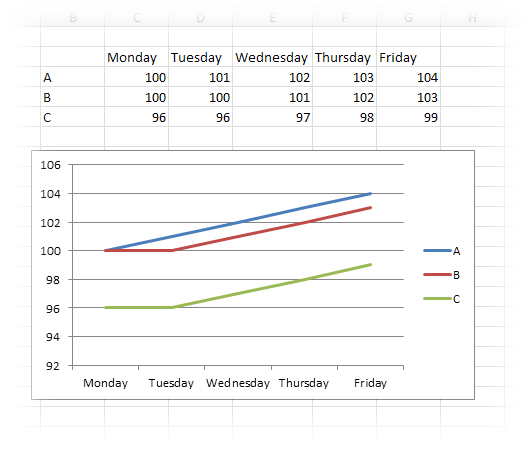 A way archive this in Excel is to integrate charts into tables, so called graphical tables, a very effective means to archive More Information Per Pixel. I already wrote about graphical tables here, here, and here. This bumps chart shows you the English Premier League 2007 – 2008. It allows you to highlight and compare two teams by clicking a team in in the table or a line in the bumps charts. Interactively highlighting a data series in a large data set is very powerful. All lines in the data set are set to light Gray to show you the big picture and the patterns and general tends in the data set. Once you have identified an interesting data series you click it and we highlight it with a bright, saturated color. This has the effect of bringing it into the foreground and allows the user to see the details in the context of the other data series. 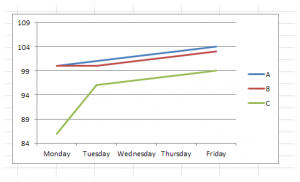 As a bumps chart has the lines equally spaced on the value axis you can put an Excel table next to the chart that serves as a legend on one side, and as a detailed ranking table on the other side. In a recent post Jon presented a way to dynamically hover over the chart legend to highlight a data series. 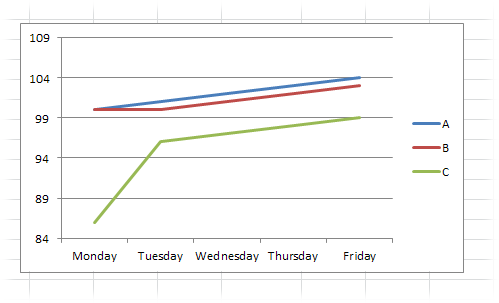 Jon’s method is very smart, as it really shows the capabilities of the event rich Excel chart programing model. The downside of this approach is that it requires you do code some VBA and only works with chart sheets. 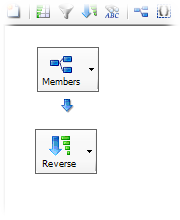 The chart events also work in theory for embedded charts, but you have to activate the chart, in order to make Excel handle your events, which is one click you want to avoid. So I picked up Jon’s idea and tried to combine it with ParamLink. In The Missing Link I introduced the (free) ParamLink Add-In. It implements a new hyperlink formula ParamLink(). 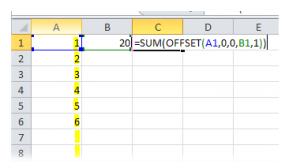 When the hyperlink is followed the formula can set cell values or define names. Igor Asselbergs was contemplating the value of round corners in design. Is it eye-candy? Or does it add value to the user experience? He comes to the conclusion that rounded corners clearly make a difference. The effect can be explained by the Gestalt Law of Continuity. Gestalt is a set of rules based on research into perception psychology, and a very powerful tool for Excel table design. In table design this effect can help us to see the table columns as a unit. 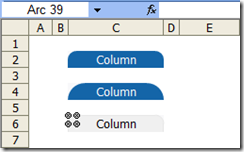 Did you ever wonder how to create rounded corners in Excel tables? The basic idea of rounded corners is putting some shape objects into the corners of the column headers. Right-click the shapes and select Format Auto Shapes > Colors and Lines. Give the arc the fill color of your table headers, and the rectangle the fill color White. Set “no line” for the both. 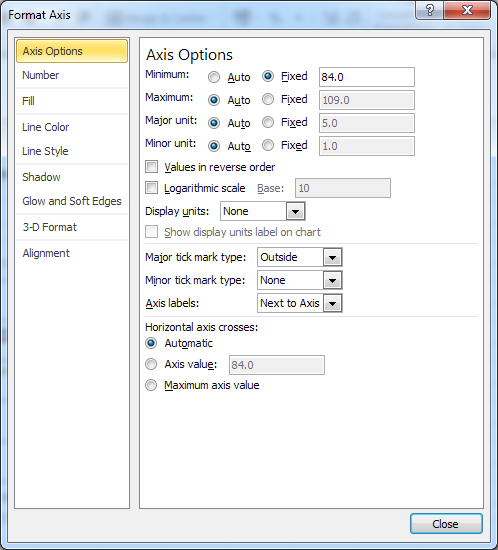 Right-click the shapes and select Format Auto Shape > Size and assign the arc and the rectangle the size 0.5″x0.5″ and set Lock aspect ratio. Select the rectangle and move it to cell B2 keeping the ALT key pressed. This ensures that shape snaps to the Excel grid. Do the same for the arc so that it overlaps with the white rectangle. 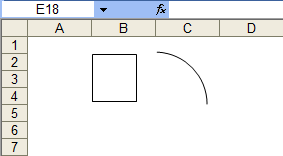 Select the arc and the rectangle and select the right-click command group.